2015 is rolling away from us so we reflect on our achievements this year and to the challenges we face in 2016. We had a good year all told settling into our new home at Unit 31. This enabled us to expand our offering and the support we give to the vulnerable in the local community. Regular groups, more variety and some very ambitious sessions. The artwork created has been outstanding on several counts. Its quality, its positive effect on the individual creators, the range and variety, the messages it contained and above all the positive feedback received from those viewing it. We have had many exhibitions this year in the unit celebrating that artwork. My favourite of the year has to be the group exhibition at the start of the year where we transformed the centre of the gallery into an installation about the journey through a mental health issue from darkness into the light which was designed and built by Emma Lowe with nearly everyone at S2C making some sort of contribution. We gave individuals the chance to exhibit for the first time such as Antony Dixon, a profoundly Deaf artist of immense talent and potential. All the exhibitions served a purpose in helping to build confidence and self-esteem among the service users. Learning how to put up and mount an exhibition was equally part of the experience. We also collaborated with many different groups and organisations. In particular Lakeland Arts who allow us to visit each new exhibition at Abbot Hall Art Gallery and then to work in the gallery on practical sessions based on the visit. Anne-Marie Quinn the Engagement Officer has done much brilliant work with our service users over the year. We also collaborated with Lakeland Arts at Blackwell Arts and Crafts House with Shannon from Lakeland Arts and Emily Taylor, an amazing ceramic artist. They produced some fabulous tiles based on a book called the Yellow Wallpaper which were displayed in Blackwell. We also have exhibitions up in the Leisure Centre where our photographs are on display of Blackwell and the Auction Mart. Our most successful collaboration was between our Creative Writing Group and over twenty local artists. They created artwork based on poems written by the group. These wer auctioned of making lots of much needed money for S2C. It has also been a year where support from Kendal Town Council has been immense with the Mayor Chris Hogg mentioning us and supporting us on many occasions as well as a useful grant to help keep the session we run on the local mental health ward going. The Comic Art Festival also brought its usual excitement with our window in Nevi Sport this year getting much positive comment. Lots of people have made use of our space too. From web design groups, networking events, CPN led courses, the CDC, a Dementia Group and many more. So to the future. What can we do and what do we need. We need to improve our funding. We are looking at projects where we can take money for artists alongside paying the rent and bills rather than just looking for rare funding for capital costs. We are also looking to raise money through our website better, having a Donate button and maybe also selling artwork through our website better. We need more volunteers. Volunteers to help us run the organisation, help service users and run sessions. We are looking to change how we manage volunteers and have specific volunteer job roles for people. Somebody to deal with online content, receptionist and admin, fundraising, session leaders, cleaning, service user support and counselling. It all requires people willing to give their time. We also want to provide more for our service users. We want to connect better, get out into the community, access Doctors and services to let them know we exist and what we can do. We want to be open more often and have a wider range of opportunities. We want to be able to link better to other services so that we dovetail into individuals support better and above all provide better individual support for people to help guide them forward in a positive way. Not much then! There is lots to look forward to in 2016 already but I will talk about that next time……. till then have a good New Year. Well its nearly another year done at S2C. Seems a long time since we set up Space2Create, it was this time of year in 2012 as the Charity Workbase was about to close. Those who took up the challenge then can be justifiably proud of what they managed to salvage and then create. A lot of what we aimed to achieve has been reached in the last twelve months in one respect, that we have our own space and we can see our way of working is successful and delivers a service that is essential and valued by some very ill people. In other respects we are no further on. Any kind of financial stability seems to be impossible, even in the short term, and we are constantly fighting fires to keep afloat. One thing that has become more difficult is on the volunteer front. We have less committed and regular volunteers now than ever. This is a real bar to expansion and maintaining what has been created. We can see the potential and have the vision. If we could only secure the resources, in terms of funding and personnel, then we could really begin to make a difference to the lives of those we help. So that is the challenge for 2016. Our New Year resolution is be better, do more, get funding, find people and improve the lives of twice as many people as we did last year. Hey I’m an optimist where S2C is concernd, I have to be. We wish all our service users, volunteers, funders, supporters, artists, visitors, likers, sharers, retweeters and friends a very happy Christmas and a fantastic 2016. The group looked at being abstract. We did this by repeating the same line or brush stroke over and over changing colours. This was done randomly. As more lines were added the paint mixed on the paper creating very abstract images. A really enjoyable and fun session with Maggie How this morning. As we are working towards writing short plays for a project in the new year Maggie had some ideas about creating characters. She had made up a handbag and asked us to imagine what the contents would tell us about the owner. From this we created many varied and different characters to work on. There was a lot of laughter as we each describes our creations. For this busy but fun session we continuing creating ‘Dreaming-style’ paintings which we have been working with on the unit last week. Using with a selection of different cards and paper, we brought acrylic paint and sharpie markers to recreate the classic ‘dotted’ style of painting using earth colours, painted on with thin and thick brushes and markers. A really fun session we looked at ways of wrapping wire round objects. We then used sea glass, stones, buttons, beads and more to create decorations and jewellery. We had an excellent visit to the Abbot Hall Art Gallery to see the Canelletto exhibition. Anne-Marie caves us a great guided tour with lots of ideas for future sessions. We have great links with Lakeland Arts and the opportunity for our service users to access such a gallery at no cost to then is very beneficial. It gives them chance to learn, have new experiences and gain an understanding of art that they would not otherwise. At S2C we were fortunate, a near thing with water lapping over our doorstep. The wall on one side have been soaked through so that patches of water came inside and one window was pouring a small waterfall onto the floor. Easy to sort. The people in studios near us who were flooded and homes I have helped to clear this week have had lives and businesses destroyed. Those people need help and the community has come together to support them in may different ways, from money to food, to essentials. We were opening our new exhibition “The Outsiders” last weekend but we will now launch it in the New Year. 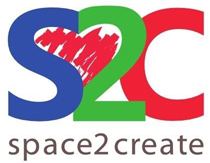 S2C is there to help those who need to come and get away, to chat and feel safe. That’s what we are good at. We have also been able to help the Deaf Community. The Deaf Centre on Castle Street was flooded so we are having the DeafArt Group we run there at our Unit as well as regular meetings they have for the Deaf in Kendal so they can continue the services they offer. It was an unprecedented weather event but its legacy will be a stronger, better linked and caring community. The group looked to sunnier lands after all the water this weekend. They were creating images inspired by aboriginal paintings. Using simple dots and lines they created a variety of shapes and patterns. A very relaxing and therapuatic morning. A mixed bag this week with lots of projects. Some carried on the aboriginal theme by decorating stones. There were people making cards, gift tags, knitting and painting too. This group carried on from others this week with painting pics and stones inspired by an aboriginal theme. Some knitted both with needles and arm knitting. Also a bit of book sculpture and card making. It has been an awful 24 hours for Kendal and Cumbria with massive flooding across the area. Our Unit at the Factory seems to have been ok but will be going to check later this morning. We were supposed to be open for the weekend but under the circumstances that hasn’t happened. It is more important that everyone is safe and their homes are not in danger. Our thoughts are very much with those who have lost homes and businesses to the flood waters. I looked with horror at the images online yesterday of the J De V gallery across the river from us slowly disappearing under water. Like us, they do so much to help vulnerable people in the area. In the aftermath of something like this we can only support and help those in the community who need help. It seems very inappropriate to post about all the great stuff that happened last week but then it is sometimes best to focus on the positive and support each other in difficult times. That’s the ethos at Space2Create and at the moment that has to extend to the wider community. Get in touch if you need us. A lovely session led by Jane. On a grey and wet morning the group looked to use some bright vibrant colour creating sunset silhouettes. Using pen to create the shadows with acrylics. For this session we set up sheets of thick acetate, mixing up water soluble printing inks, rolling out until the ink and drawing directly through different types of paper to create monoprints. Using magazines we also traced some images through the paper, producing a range of styles and marks. Christmas was in the air as we had a bit of a making session getting ready for the mayors Christmas fair. We also decorated our wood tree. Kirsty led the session making sock snowman. Clare was making lovely wire bound jars to hold small candles. A very relaxing and fun session enjoyed by all. The session was centered around three different mono printing techniques, where we drew freehand through different papers and inks, we also traced through magazine images and cut out stencils to print over using a variety of tools such as a wooden spoon, our fingers and an ice scraper for a car windscreen..
We also printed up some leaves and pressed the ink side onto paper. Using watercolours and drawing inks, we added splashes of colour to the finished prints.